As part of my postdoc with Gideon Bradburd, I’m using his new software package conStruct (bioRxiv; GitHub) to analyze dozens of genomic datasets. conStruct requires three input files: 1) genetic data, 2) coordinate data (longitude in the first column, latitude in the second), and 3) a pairwise distance matrix with the same number of sites as in the coordinate data. Files 2 and 3 are straight forward; but it took me a little time to be able to go from a regular STRUCTURE file to a conStruct file. So below is the R code I’m using to do this conversion. Now if your data is not already in STRUCTURE two row format (i.e. two rows per sample), then you’ll need to get there as a starting place. I used PGDSpider to make the STRUCTURE files WITH a header row and a column to denote sampling site. conStruct can take data as counts or frequencies. 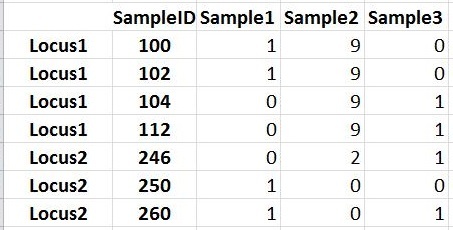 The code below makes a table of frequencies for one allele (doesn’t matter major or minor, derived or ancestral) for each sampling site for each locus. I have written this as a loop to process multiple input files at once. You can remove the for loop and start at “str <- read.table()” if you only have one file. As I noted in the code, my friend Jake Burkhart wrote the internal for loop that makes the frequency table. He originally wrote the loop to make pseudo-SNP datasets out of microsatellite data. Which means, if you want to run conStruct on a microsatellite dataset, you can print all of the loci (instead of just one of the biallelic SNPs), then keep processing the frequencies at each sampling site. Note, conStruct will throw an error if there are fewer loci than samples, which shows up more readily when using pseudo-SNP data from (even highly polymorphic) microsatellites. This entry was posted in Data Analysis and tagged Bioinformatics, Getting Genetics Done Ineloquently, microsatelites, SNPs, software on May 2, 2018 by EEPuckett. I want to use BayesAss on a large SNP dataset generated with RADseq. But I found out when I went to convert the data into the .immaq format that my favorite converter, PGDspider, would only convert the first 40 loci. I didn’t get 10,000s of loci for nothing, so that wasn’t going to work. But a second problem was that BayesAss 3.0.3 only allows 240 SNPs anyways. Obviously I’m not the only person with this problem. And thanks to Steve Mussmann there’s a solution. Steve re-wrote BayesAss 3.0.4 to be able to handle large SNP datasets, as well as a program to convert the STRUCTURE files from pyRAD into .immaq input files for BayesAss. Since I have STRUCTURE files from STACKS and not pyRAD, I had to do a little conversion. My messy code is below, but leave a comment if you are a wiz with an elegant solution. First, output data from STACKS in STRUCTURE format (.str). Remove the first two rows from this output (STACKS header and loci identifiers). Then, print the first column (sample names), insert five empty columns to match pyRAD. Do not print the second column from the STACKS STRUCTURE output because that is the population code from your Population Map input into STACKS. Next, print out the remainder of your data starting at column 3 (i.e. first locus) in the original dataset (awk code from here). Then use paste to concatenate the two files into the .str file you will convert. Since STACKS exports missing data as 0 (whereas pyRAD exports missing data as -9), this change removes converting missing data from -9 to 0. Steve also wrote this change. Save the change in the perl script, then use the script to convert data from .str to .immac. Now you’ve got an input file for BayesAss. This entry was posted in Data Analysis and tagged Gene flow, software on October 1, 2017 by EEPuckett. At this point, who hasn’t read Patterson et al 2006 about population structure and eigenvector analysis? It’s a great paper as it introduced the EIGENSOFT package for analyzing genomic data using principal components analysis (PCA). PCA is a great way to identify both population structure and admixture relationships. For anyone that works with microsatellites, you no doubt noticed the paragraph that says you can use microsatellite data as the PCA input. However, the input format is not all that clear for how to convert your data. This post provides an in-eloquent way of doing the format conversion using Excel tables. Let’s start with our data in double column format (e.g.- STRUCTURE format). Note that Sample2 is missing data at Locus1. You need to convert your data so that each allele of a microsatellite in your dataset has its own column. In the toy example there are four alleles for Locus1, and three alleles for Locus2. 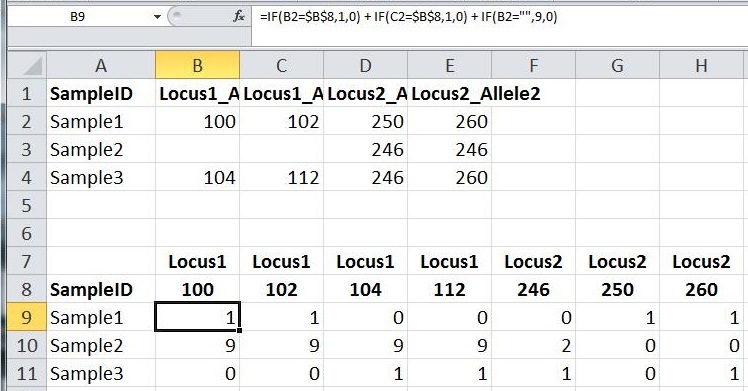 In Excel, I set up a new tab with the paired locus and allele information. Also remember that it is important to keep the sample order the same as in the two column format. The next step is to populate the new table with the number of alleles (0, 1, or 2) that each sample has for each locus_allele combination. While this may be simple enough to do my hand for toy datasets, it is much easier (and less error prone) to use formulas in Excel to populate the new table. I used an if/then statement. 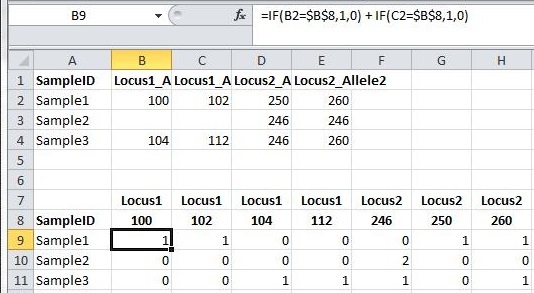 Specifically, if the allele in the first column for the locus of interest was equal to the allele in the header row, then populate that cell with the value of 1; if the values in Tab 1 and Tab 2 are not equal, then populate the cell with a 0. 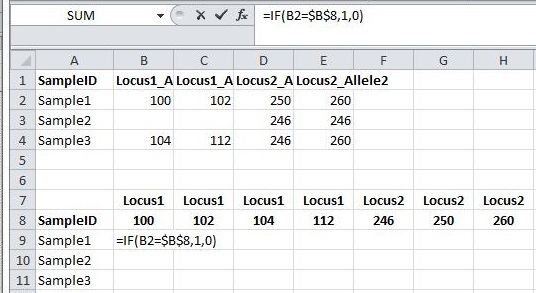 Write formulas for each locus_allele combination for the first sample, making sure to lock the right hand of the equation (allele value to compare the data to) using dollar signs before the row and column identifiers. Once formulas have been written for the first sample, you can drag the equations down to populate the full table. Yay! There are now counts for all of the alleles. However, we still have to account for the missing data. To do this, we can still use the same idea as before by adding another if/then statement, but this time it will evaluate if the cell in the original data (Tab 1) is blank. Blank cells can be coded in Excel as empty quotes (e.g. “”). Since missing data should be missing in both columns in the original double column data (Tab 1), we only need to evaluate the first column, and assign it a value of 9 if it fulfills the if/then statement. Now we see that Locus1 of Sample2 has been coded as missing data (9) at all alleles. Copy just the values (no sample or locus names) and paste into a text file, then remove the tabs between each column that Excel inserts. Finally, you may be asking why go through all of this trouble to use EIGENSOFT for PCA when you could also make one using the R package adegenet? I like EIGENSOFT because you can analyze the output with Tracy-Widom statistics (within the EIGENSOFT package) to identify which principal components are significant versus less rigorous ways such as observing the plateau of eigenvalues. This entry was posted in Data Analysis and tagged genetics, Getting Genetics Done Ineloquently, microsatelites, PCA on May 10, 2015 by EEPuckett. I’m new to Perl so this may not be the most elegant script. The script converts fastPHASE output into a ChromoPainter input file. The for loop makes an input file for each scaffold for which my data maps to (in my case 284 scaffolds of the polar bear genome). print CHROMOFILE @phasefile[0..187]; #I have 94 samples (diploid); therefore, 188 haplotype lines when -Z flag used in fastPHASE. This prints all lines of the file fastPHASE output to ChromoPainter input file. This entry was posted in Data Analysis and tagged Bioinformatics, ChromoPainter, Data Analysis, fastPHASE, Perl on December 8, 2014 by EEPuckett.